Taking a shower in unfiltered tap water is no laughing matter. Using a water filter for the shower is one of the most important things we can do to protect our health. Unfiltered shower water from the tap can contain many harmful chemicals such as chlorine and its by-products, as well as bacteria and fungus from the shower head. You might not think this is such a problem since we don’t drink the water, but we absorb these toxins through our skin and inhale them in the warm water vapors while we shower. The following are 3 of the main reasons to consider using a water filter for the shower. One of the main reasons to consider using a water filter for the shower is because of the long-term health effects of chlorine and is Disinfection By-Products (DBPs). Studies have shown that exposure to chlorine itself while showering is not the main problem. It has more to do with the long-term health effects of chlorine’s DBPs. When chlorine mixes with any type of organic matter in the water, it can form Trihalomethanes (THMs), one of which is chloroform. THMs are highly carcinogenic (cancer causing) and increase the production of free radicals in the body. Chlorine and THMs have been linked to kidney and liver damage, hardening of the arteries, immune system dysfunction, respiratory problems, bladder cancer, as well as skin problems. You can read more here on the negative effects of chlorine and its DBPs on human health. 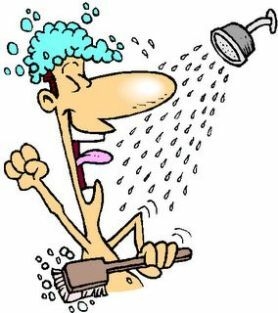 When we take a shower, the chemical vapors from tap water are released into the air. The heat of the shower can cause these chemicals to be released into the air at higher amounts than are even present in the water. The Environmental Protection Agency found changes in the indoor air quality of homes after showering in tap water, including significant levels of THMs and other by-products. The inhalation of chlorine and other chemical vapors into our lungs while showering or bathing in unfiltered water means that these chemicals enter directly into our bloodstream. Exposure to these chemical vapors can aggravate sinus, throat and respiratory conditions, such as asthma, allergies, bronchitis, sinusitis, and COPD. When we take a shower, the hot water opens skin pores for higher absorption and the water contacts almost every part of the body. Studies have shown that chlorine from unfiltered tap water easily enters the bloodstream when showering. Chlorine is a disinfecting agent that is proven to kill bacteria in water. While its disinfecting properties are beneficial in some situations, the long-term effects of bathing in chlorinated water can cause dry or irritated skin, as well as brittle or damaged hair. Thus, I often say if you only have $50 a year to invest in your health, buy a shower filter. You will get the most bang for your buck by preventing the long-term exposure to chemicals in water, especially chlorine and its by-products.